Corporate Profits Or Balance Sheet - What Actually Matters for S&P 500? Home › Market notes › Corporate Profits Or Balance Sheet – What Actually Matters For S&P 500? Corporate Profits Or Balance Sheet – What Actually Matters For S&P 500? ECB said on last Thursday that it plans to halt bond-buying program in December 2018. According to the press release, monthly asset purchases will be reduced from 30 to 15 billion euros In October, and from the beginning of next year the balance sheet will stop to grow. In 2019 the ECB will remain on the market and will stick to reinvestment policy, i.e. the funds received at maturity will be used to buy European bonds. It means that there won’t be aggressive bond buying and instead ECB will try to maintain its balance sheet on some fixed level. 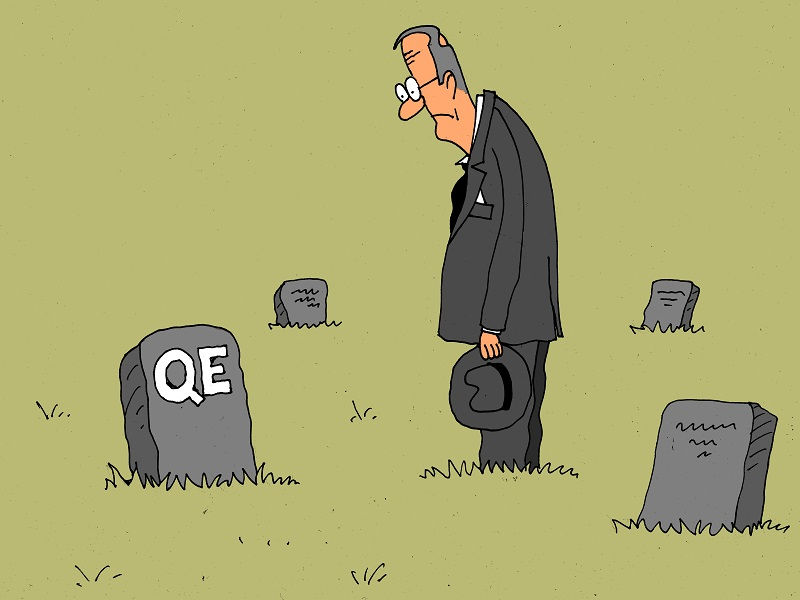 The regulator from the Old World will be the second major Central Bank which will stop the printing press. However, the ECB didn’t follow the example of the Fed and refrained from selling bonds on the bond market in order to not depress prices too much. 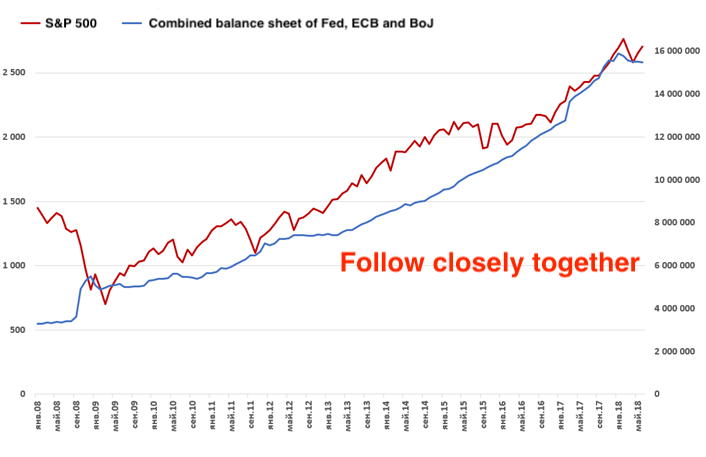 By the current summer, combined balance sheet of three major Central Banks – the Fed, the ECB and the Bank of Japan reached 15.5 trillion dollars. Due to the measures of the US central bank initiated in October last year, the balance sheet has been stalling this year. Recall that the Fed will enter a “cruising speed” in the bond sell-off by October 2018 offering a rising bond supply with increments of $50 billion per month. Combined balance sheet and S&P 500. Source: Bloomberg. Tightening policy of the world central banks can lead to a bursting of the bubble, which they created themselves. And today’s bubble is not so big in stocks as in bonds. With the cut in ECB bond buying program this fall the liquidity deficit may start to increase which eventually should also affect the stock markets. A rise in borrowing costs may put brakes on the growth of investments divesting stock markets a major driver in company valuations – fresh positive NPV projects. So far, the growth of corporate and US corporate profits could happen due to low costs of debt servicing and fiscal measures, like tax reform. In the absence of new expansionary policies the drop that the markets faced in February of this year may soon happen again. Investment funds continued to reduce their long positions in oil, however, without increasing short ones. Over the week from July 17 to July 24, the volume of long positions in the portfolio of hedge funds fell from 419 thousand contracts to 412 thousand. 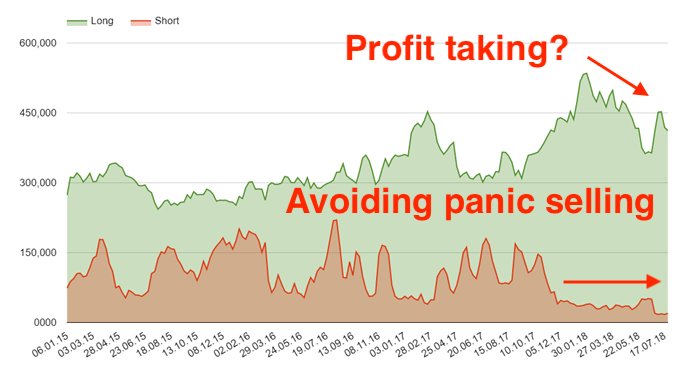 At the same time, short positions increased from 17,4 thousand to 19,9 thousand. Thus, the net ” long “for crude oil dropped to 392.1 thousand contracts – the lowest in July. At the same time, stalling number of short wagers from hedge funds may indicate that they become increasingly neutral on oil. They take profit and do not seem to believe in the trend U-turn. Small individual traders were the group accounted for major buyer surplus on the market – the volume of their net longs is 44 thousand contracts. Throughout this year, they are betting on the growth of prices. From the beginning of February 2018, the data shows that hedge funds are gradually liquidating their bets on oil growth. The gradual fashion of this aimed at avoiding sharp drop in prices which will cause panic selling and may thwart plans on finding marginal buyers. Secondly, market participants could doubt the stability of the world economy, because the reduction of long positions coincided with the collapse of stock markets in the US and long bets so far have not returned to highs of the beginning of this year. Since early July, oil price have lost $5. The asset turns into defensive mode so price rebounds are more likely to be short-lived. During this month, the price of Brent oil dipped below $72 but then it turned to fragile recovery and reached $75. Here oil met resistance, bouncing off an uptrend line. And if oil wants to go higher, then it has to stage a breakthrough. While this did not happen and correction happens along the trend line which presents the lower bound. That is, it looks like a transitory rebound and it’s too early to talk about the renewal of sustainable rally. Currently oil prices are in the resistance range between 72 and 80 dollars per barrel. 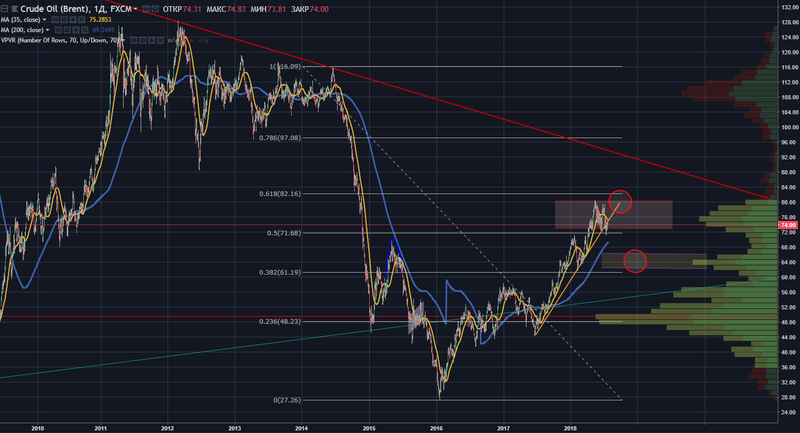 The first level of support, in turn, is in the region of 69 dollars (200-day average), and the second between 64 and 66 dollars. To continue the rally is necessary to breakthrough the mark of 75.2 dollars per barrel in the first days of August. If bullish forces succeed, the next resistance will have to be around $80, where the upper boundary of the corridor is located. If the quotes fail to break through the resistance level, then the odds of a rollback down to a level of 66-64 dollars are much higher.